My favorite way to memorialize a trip to the beach has always been taking home a cooler of fresh seafood. For one magic summer, while I was in college, I alternated camping on the beaches of Ocracoke Island with camping in the National Forests of western North Carolina. Nowadays, fresh shrimp is just down the road from us at one of the local seafood vendors who catch the shrimp right here in our local waters. In my youth, I would take the long way home from Ocracoke which as any well-versed traveler of Route 12 knows is the Cedar Island Ferry. I would stop in Morehead City for a meal at Captain Bill's (which has been replaced by Southern Salt ) and then fill a cooler full of fresh off of the shrimp boats and head home. Five to six hours after loading the cooler in the car, I would be cleaning and boiling shrimp for a straight from the sea treat. I'm pretty convinced that most folks think shrimp come from the grocery store. It has gotten more and more popular to buy your shrimp at the grocery store and have them steamed right there. I'm no purist but I would rather have my shrimp cooked after they've been cleaned, and grocery stores don't do that. You may not know the difference because you've never tasted shrimp that have been done right. It's not that hard, but it does take some time. You do need one tool, a Shrimp Deveiner. The one I have looks exactly like that picture. (Update 2018- They usually cost a couple of dollars locally but they seem much more expensive on Amazon eight years after I wrote the original article) The next thing you need is fresh shrimp. Ideally, you try to get your shrimp as close to the boat as possible. In most cases that means asking around locally to find out the best way to buy your shrimp. Sometimes you can buy them right off the dock or from people who buy them right off the dock. The shrimp should be firm and not mushy. Often the shrimp you buy will have the heads still on the body. Do yourself a favor and have the folks where you buy the shrimp take the heads off if at all possible. It seems almost effortless for them, but for normal mortals, it's a little more of a challenge. Take a cooler and ice your shrimp down if possible. Often the seafood shop will give you enough ice for a small cooler. The biggest challenge with cleaning shrimp is that it is pretty boring. We usually get three to four lbs of shrimp, weighed with the heads still on the shrimp. That's about my limit. After that, I lose interest even if someone is feeding me freshly boiled shrimp. By the time you take the heads and shells off, four pounds with the heads on are equal to approximately two pounds shelled and raw. 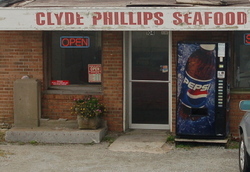 In the Swansboro, NC area we buy our shrimp from one of the local legends, Clyde Phillips Seafood, located between the bridges on Route 24. Don't expect a lot of conversation but Jimmy who owns the place knows more about seafood than anyone I have ever met. You can count on fresh seafood and a magic touch for removing shrimp heads. There is also Captain Sam's in Cedar Point and Captain Willis Seafood in Emerald Isle, but you won't find me there as long as Jimmy has shrimp. Learning to use the shrimp deveiner just takes a few shrimp and they don't seem to mind. Just focus on the big top vein. You can ignore the bottom one. The twist at the end is the secret touch. Once you have deveining mastered, you can start thinking about cooking them. We cook them in batches so that we can cool them easily. My suggestion is to clean about one half your shrimp and then bring to boil about two to two and one-half inches of water in an uncovered twelve inch deep (three quart) skillet. If you have cleaned your shrimp the way I suggested, they cook without any smell. My wife, Glenda, says she adds some salt, an amount or pile about the size of a quarter in her palm. She dumps the shrimp in the boiling water and has a timer running from the minute the shrimp are dumped in the water. The shrimp cook very quickly and are done in three minutes when they've turned a beautiful pink color. As soon as they are done, my wife dumps them in a bowl of water filled with ice. We then fish the shrimp out and let them drain in a colander. All you have to do then is to put them in a bowl or on a platter if they are going to be eaten immediately. Once you have had real fresh shrimp done right, going back to anything less is tough to do. I can highly recommend Kelchner's Cocktail sauce. It does vary a little between batches so I try to be a little forgiving since it is the best I've ever had. 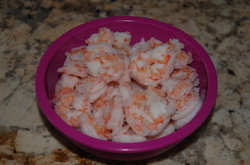 If you want to know more, this link on shrimp is very helpful as is this link on cooking shrimp. You aren't able to read the sticker in the lower left corner of the leftmost window at Clyde Phillips, but it says "Friends don't let friends eat imported shrimp." Just click on the link to the left for a view of the bumper sticker. There is little doubt that I am a big barbecue fan. I have written about a number of barbecue spots like Bastians in Roanoke, Va in my post "Friday night at the Barbecue Joint." 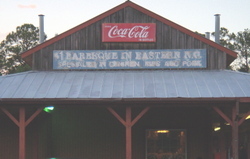 Then I wrote about a spot actually called the "Barbecue Joint" located on Weaver Dairy Road near Chapel Hill, North Carolina. It was mentioned in my post, "Back to the mountains." Then there was the visit to Allen & Sons Barbecue, Chapel Hill, NC which was recommended by my friend Cameron. When I took my real estate broker course in Hickory, NC, I discovered a really great spot, "FireBonz." I even hauled back barbecue in a cooler to Roanoke a couple of times from Firebonz. There have been a very few barbecue meals that I didn't consider a success like the one we had at Olde Virginia Barbecue in Rocky Mount, Va. However, the general rule is that any barbecue is better than no barbecue. As I said in "Barbecue And More Barbecue," I love barbecue. Since I have been wandering around North Carolina's Crystal Coast, I have been suffering from a barbecue drought. Early one morning on my way to a very useful NC broker post licensing course in Wilmington, I happened to notice a metal roofed building called "The Smokehouse" on the west side of US 17. I made a note of the mileage, and promised myself if that I had a good day in class that I might stop by and check it out on the way home. We had one of the most productive days that I have enjoyed in my many real estate classes. With that as a background, I was on the lookout for The Smokehouse. I walked in and without even looking at the menu, I asked if they did barbecue by the pound. The young lady said yes. I ordered a pound with some slaw and two buns. Complete with tax, the meal came to $9.08. I did not even have to ask, I got chopped pork. About forty five minutes after leaving, I backed down our driveway on the east side of the White Oak River in Carteret County with what I hoped would be my first successful capture of real Eastern North Carolina barbecue. We made our sandwiches, and it did not take Glenda, my wife, and I long to decide that I will be swinging by The Holly Ridge Smokehouse whenever I get a chance in my travels to Wilmington. The barbecue was very lean with a nice hint of vinegar without being overwhelming. The slaw was also crunchy and tasty. 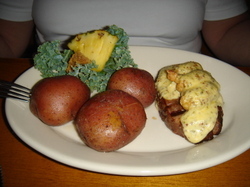 The meal was a winner, a great bargain, and there is even enough left for Glenda's lunch tomorrow. I wonder how their fried chicken is? There's seems to be a shortage of that also along the Crystal Coast. The Smokehouse opens early every morning. If a full parking lot is an indication of good food, their breakfast must be very good. Finding Coastal Community Market in Beaufort was a nice surprise. I have always been hooked on health food stores, and this one seems especially well stocked considering its size. Finding one product on their shelves solved a major challenge for me. It is funny how you carry around little tidbits of things that have stuck to you like a Velcro ball during the course of your life. One of my Velcro balls is Marmite which most people have never heard of unless they have a British or Australian connection. Marmite gets an almost mystical hold over you. London, England's Guardian has a story about the history of Marmite. 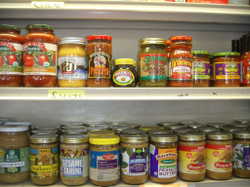 Marmite is vegetarian yeast extract that tastes like meat but is actually full of vitamins. My preferred way of eating Marmite is spread it very thinly on buttered toast. A couple of English friends that we met in Canada introduced me to Marmite. It was love at first taste for me. I actually brought some home from London once. You don't just go down to the grocery store and buy Marmite unless you live in Canada, Britain, or near one of the stores which are enlightened enough to carry it. A measure of Roanoke's growing sophistication is that it is no longer a challenge to find Marmite in Roanoke. I actually have purchased Marmite at the Kroger at Tower's Shopping Center. My regular spot to buy Marmite in Roanoke is the Roanoke Natural Foods Coop, but they went through a shortage in late 2007 so I picked up some Marmite from Fresh Market. In Northern Virginia many of the Giants carry Marmite. I haven't tried looking for Marmite at Ukrop's yet, but I would be surprised if they didn't carry it. Finding Marmite on North Carolina's coast is a lesson in how serious the settlers were in keeping all things British out of the area. However on a trip over to Beaufort, we visited the new Coastal Community Market which is located at 606 Broad Street. I was pleasantly surprised to find Marmite on the shelves. It was also priced a little less expensive than my last bottle. The shopkeeper was almost excited to find another person who likes Marmite as I was to find a local source of one of my favorite treats. I will not encourage people to taste Marmite because it is expensive at over $5 per bottle, and I suspect the majority of people would not like it. Also I would hate to see Marmite wasted, and I would be even more upset with an artificial shortage created by Marmite tasters whose taste buds cannot handle the intense flavor. Marmite is the key ingredient of my "perfect" breakfast which I haven't had in ages since I switched to turkey sausage. I might have to do one of those breakfasts soon. My wife likens Marmite to country ham flavored axle grease. She also doesn't like soft shell crabs and scallops. That makes her taste buds suspect in my book. If you have enough strength of character to be interested in Marmite, this link will get you to the FAQ that the Guardian published last summer. Just don't eat it all. We have been back to Coastal Community Market a few times. We bought some millet and cracked wheat for my bread baking experiments. Our last trip we bought some wonderful dill flavored cheese. The store is extremely well stocked including some frozen meat, fresh local eggs, and some organic produce. It is great to have a local natural foods store. We'll be visiting Coastal Community Market often. For more information visit their website or give them a call at (252) 728-2844. I am not sure when or where I first got to enjoy a Chinese buffet. It just might have been in Blacksburg, Virginia with my old friend Butch in the late eighties or early nineties. It was a great way to have a pressure free business lunch. Later when I was a manager at Apple Computer, the local Chinese Buffet in Reston, Va became our favorite place for employee lunches. It was one of the few places that we could find a table that would seat eight without reservations. The food was also inexpensive. It was nice that people could pick whatever they liked even if was just tofu. Later we were lucky to have Szechuan Restaurant move to close to our house in Roanoke, Virginia. They brought with them a buffet that turned out to be an excellent place to bring the kids for Sunday lunch. My wife is not a big Chinese buffet fan so I have probably found more good buffets when traveling for business than when on family trips. I have eaten in Chinese buffets in Los Alamos, New Mexico, Mount Airy, North Carolina, and many places in between the two spots. Recently I did convince my wife to try King Buffet in Morehead City, North Carolina. It turned out to be a great find. Glenda, my wife, even likes it. They have a great variety foods, and it is one of the most economical meals around. You even get hand dipped ice cream for dessert. In November 2006, I was down in Wilmington, NC finishing my real estate courses. I had planned to eat at a local Internet Cafe so I could check my mail, but it was closed. I took a chance on Dragon Garden, which I had noticed the day before when grabbing a sandwich at Jersey Mike's. I knew that I had lucked into a really good Chinese restaurant when I heard someone at another table say that they had been coming to Dragon Garden for Sunday lunch for years. The buffet was definitely one of the best that I have tried. All the food was well cooked, very tasty, and a little different than some of the buffets. I especially liked the shrimp fried rice. My only complaint is that I wish the food had been labeled. I will certainly try Dragon Garden out again the next time I am in Wilmington. 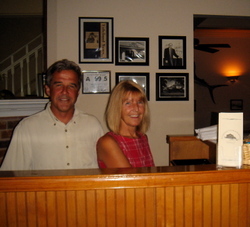 Kathy, a real estate agent, took us to lunch at the Icehouse Waterfront Restaurant. We found the food to be great. We even went back on our own before we headed back home. 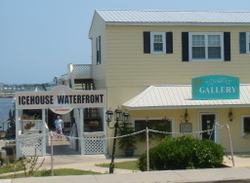 The restaurant is on the water in the historic fishing port of Swansboro which is about 21 miles west of Morehead City. 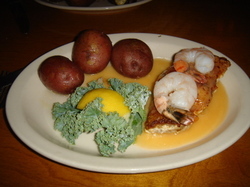 Most people think of flounder when they think of fish and the North Carolina coast. 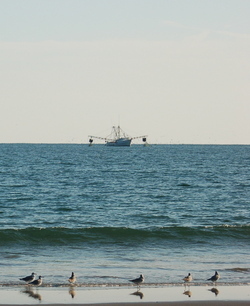 My favorite fish is Grouper, and this is the area to find it whether you like it fried or broiled. The house special is a great way to get introduced to Grouper. They have a great Grouper lunch sandwich. On our first visit a guy came in and sat down just as mine was being delivered. He quickly told his waitress as he pointed to my sandwich, "I'll have whatever he's having." It was even good enough for my wife, Glenda, to have twice in a row. That is something that she rarely does. It's the Grouper Grandwich pictured to the left. I will have trouble investigating the menu more thoroughly since we really like that Grouper Granwich. I did try their lemon-ginger-chicken soup which was also very good. The second trip, we split an order of coconut shrimp which comes with spicy peanut dip and raspberry dip. Surprisingly both dips were very good. The dessert tray looked deadly, but you can walk off dinner if you turn the ladies loose shopping in Historic Swansboro which seems to have plenty of small shops that are good at keeping the ladies happy while the guys go fishing. The Icehouse Waterfront has a couple of outside seating areas and a couple of interior ones . 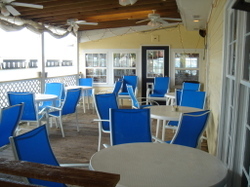 It also has a bar and some Martini specials for those who care for alcoholic beverages. 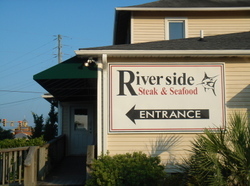 The restaurant is located at 103 Moore Street at the corner of Front Street in Swansboro, North Carolina. It is on the water, and we have actually eaten outside in December. The ocean is a little deceptive in this area. It's actually to the south instead of to the east of you. That's just one of the pleasant surprises of the Crystal Coast. For more information you can call 910.325.0501. We ended up loving the area. We bought a place just a few miles from the Ice House. 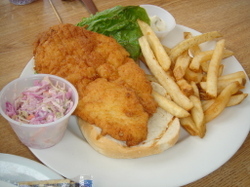 We have been back many times, but the Grouper Grandwich is still one of my favorite meals.